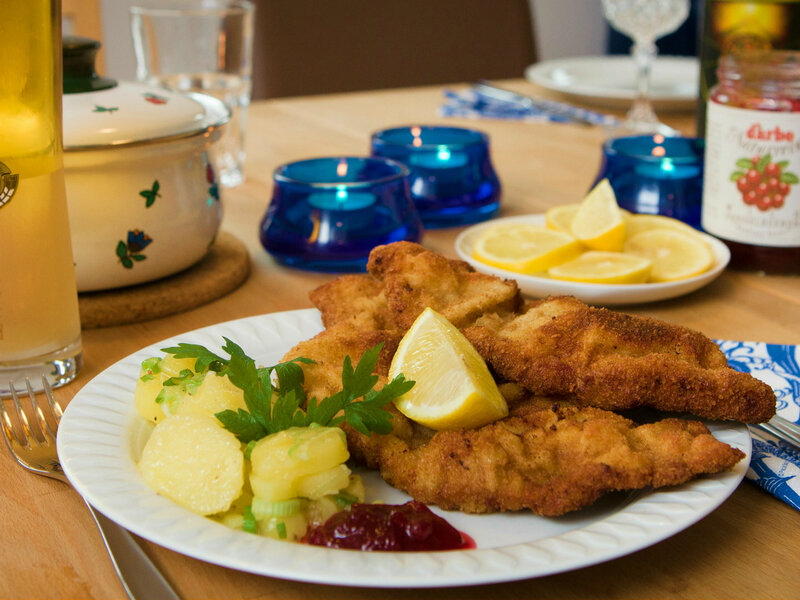 Traditionally, Austrian schnitzels are served with a warm potato salad and cranberry sauce. Kids usually prefer it served with fries and ketchup! The recipe is quite simple to make and constitute a typical and friendly “Sunday dish”. In Austria, everyone loves it. There are vegetarian versions of the schnitzel including, for instance, pumpkin. Cut the veal in ½ cm thin fillets and pound them (softly) with a mallet or hammer on each side. This makes the meat soft and tender, the edges can be cut in if the meat is thicker. In the meantime, heat the oil (at least 1 cm deep) in a frying pan. Salt the schnitzels on both sides. Coat the schnitzels in flour until it is fully covered, then in the beaten eggs and then gently in breadcrumbs. Shake the Schnitzel (again softly) to remove excess of breadcrumbs. Place the schnitzels in the pan. The schnitzels must be sizzling. Turn the schnitzels over when the first side is golden brown. This takes approximately 3 minutes per side, depending on how thick the meat is. Take the schnitzels out off the frying pan and lay them on a plate covered with paper towel to absorb excess of oil or fat. Serve hot and crispy with slices of fresh lemon.